Wong, P. C., Cowley, W., Foote, H., Jurrus, E., & Thomas, J. (2000). 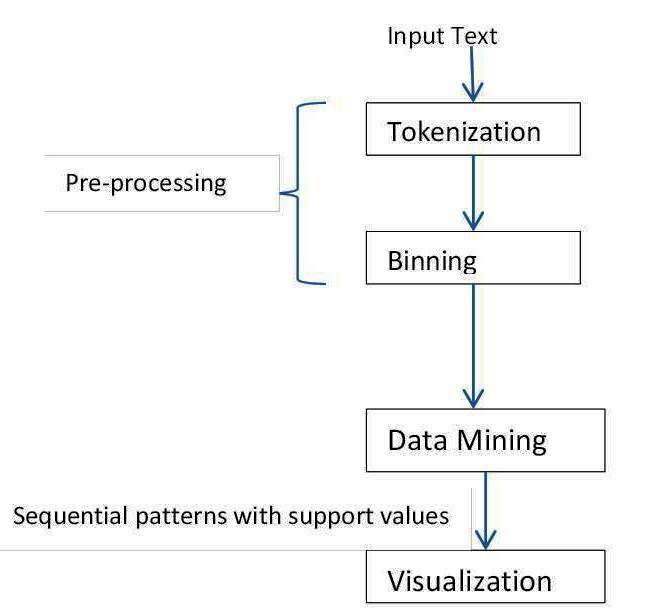 Visualizing sequential patterns for text mining. In Information Visualization, 2000. InfoVis 2000. IEEE Symposium on (pp. 105-111). IEEE. Mining Sequential patterns aims to identify recurring patterns from data over a period of time. Presenting a visual data mining system that combines pattern discovery and visualizations. Open source corpus containing 1170 news articles from 1991 to 1997 and harvested news of 1990 from TREC5 distribution. Topic Extraction: Identifies the topic in documents based on the co-occurrence of words. Words separated by white space evaluated – stemming done, prepositions, pronouns, adjectives, and gerunds ignored. Plotting topics/ topic combinations over time. Strength: Can quickly view overall patterns and individual occurrence of events. Weakness: No knowledge on exact connections that make up the pattern and statistical support on the individual patterns. Building patterns on n-ary tree with elements as nodes. Patterns are valid if the support value is greater than threshold. A sample pattern mining from given input data is given in Figure 2 of the paper. Strength: Provides accurate statistical (support) values for all weak and strong patterns. Weakness: Loses temporal and locality information, large number of patterns produced in text format making human interpretation harder. Combining visualization and data mining to compensate each others’ weaknesses (Refer Figure 4 & 5 in the paper to see the pattern visualizations). Binning resolution can be changed to see different patterns based on day, week, month, year etc. Patterns associated to a particular topic can be picked. Strength of pattern is not easily identifiable from the visualization without statistical measures. Pattern mining gets enhanced by graphical encoding with spatial and temporal information. Knowledge discovery by humans is aided by combining statistical data mining and visualization. Handling larger data sets using secondary memory support and improve display. Integrating more techniques like association rules into visual data mining environment. Teufel, S., Siddharthan, A., & Batchelor, C. (2009, August). Towards discipline-independent argumentative zoning: evidence from chemistry and computational linguistics. In Proceedings of the 2009 Conference on Empirical Methods in Natural Language Processing: Volume 3-Volume 3 (pp. 1493-1502). Association for Computational Linguistics. Aim, Background, Basis, Contrast, Other and Textual. Establishing a modified AZ scheme AZ-II with fine grained categories (11 instead of 7) to recognize structure and relational categories. Experimenting annotation using AZ scheme in two distinct domains: Chemistry and Computational Linguistics (CL). Testing an annotation scheme to systematically exclude prior domain knowledge of annotators. Domain independent categories so that the annotations can be done based on general, rhetorical and linguistic knowledge and no scientific domain knowledge is necessary. Justification is required for all annotations based on text based evidence such as cues, and other linguistic principles. Discipline specific generics are provided based on high level domain knowledge so that the annotators can identify the validity of knowledge claims made in the domain (E.g. a “Chemistry primer” with high level information regarding common scientific terms to help a non-expert). Guidelines are given with descriptions for annotating the categories; some categories might require domain knowledge for distinguishing them (e.g. Authors mentioning about the failure of previous methods: OWN_FAIL vs ANTISUPP, Reasoning required to come to conclusions from results: OWN_RES vs OWN_CONC). Independent annotations using web based tool. Refer example annotations in appendix of the paper. Inter-annotator agreement: Fleiss Kappa coefficient, κ = 0.71 for Chemistry and κ = 0.65 for CL. Wide variation in the frequency of categories –> fewer examples for supervised learning for rare categories (Refer ‘Figure 3: Frequency of AZ-II Categories’ in the paper to see the frequency distinctions between the two domains). Pairwise agreement calculated to see the impact of domain knowledge between annotators: κAB = 0.66, κBC = 0.73 and κAB = 0.73 –> Largest disagreement between expert (A) and non-expert (C). Inter-annotator agreement to see the distinction between categories: κbinary = 0.78 for chemistry and κbinary = 0.65 for CL –> Easier distinction of categories in Chemistry than CL. Comparison of AZ-II to original AZ annotation scheme by collapsing into 6-category AZ annotation: κ=0.75 –> annotation of high consistency. Positive result for domain independent application of AZ scheme and training non experts as annotators. Annotating more established discipline like Chemistry was easier than CL. Expanding annotation guidelines to other disciplines and longer journal papers.